Yes, I know what the title of this post may imply. Never-fear, that side of my personal life will never make it to print, and for good reason… it probably wouldn’t sell. It was a very cool and crisp Thursday morning, and I was in a rush to be at work on time for a series of early morning meetings that I run with a fairly large audience. I was trekking the same roads I take most every day, nothing special or out of the ordinary. Until I was halfway to the office anyhow, that’s when I caught sight of a situation on my left that ended up being one I’ll most likely never forget. Upon entering an underpass that scoops beneath a railroad crossing overhead, I noticed a man on the opposite shoulder of the road lying on the ground and struggling with what looked like a lawn chair. He was totally alone, a silhouette against the littered and overgrown earthen embankment just behind him. My glance was quick, I was only able to see him for a split second before three lanes of opposing traffic blocked my vision and I sped past. It’s amazing how fast the human brain processes information. Immediately, my conscience knew something was wrong and then just as quickly it split into two opposing forces: Turn Around and Help versus Forget What I Saw and get to work on time. It was like these two forces were boxers, dropped into a ring and a bell rung to start the fight. Turn Around and Help was quickly pummeled and swiftly knocked to the canvas by Forget What I Saw, because everyone knows that It’s Not Your Concern is this heavyweight’s trainer. But before the smelling salts were administered, Turn Around and Help unexpectedly rose up and delivered a KO punch to Forget What I Saw and then came the ten-count. Bout over. I turned around and drove past the man once again, this time on my right, and I could clearly see that he was on the ground and unable to pull himself back into his motorized wheelchair that he had somehow fallen from. He was on the wrong side of a very busy five lane road, on a shabby dirt path instead of the paved sidewalk on the opposite side of traffic. I had to drive past him in order to keep traffic flowing, but then turned around yet again to come back to him a third time… this time determined to stop traffic if needed and somehow assist the man. I parked my jeep smack in the middle of the road to an immediate symphony of car horns from unhappy commuters, played my own live game of Frogger, and got to the stranger. In short order it was obvious the man was severely disabled and also unable to speak. He was without socks and shoes, and very under-dressed for the temperature. I was able to get him back into his chair. By this time another commuter stopped, and as a duo we blocked all lanes of traffic and carried the man in his wheelchair to the proper side of the road. He smiled at us, pushed a joystick forward and whisked off on his way to wherever he was going. I stood there, completely confused at the speed of everything that just happened then finally got back into my vehicle and continued onward. I’m not journaling this event with the hopes of trying to convince myself that my conscience is half-way decent. Quite the opposite, in fact. It’s shameful that for a fleeting moment I struggled with doing the “right thing.” I was in fact late to work and I spent the morning replaying the event over and over in my head, wondering what I should have done to offer the man warmth and maybe some clothing. At the very least my shoes. But that isn’t where the event became memorable for me. That came later in the day when I believe God thumped me in the head for the second time in my life via text. Classify me as crazy or say I was perhaps over-sensitized that day. Decide for yourself. But I don’t believe that to be the case. I believe that God leaned into my day to remind me that He’s watching and expects me to be a decent human being. 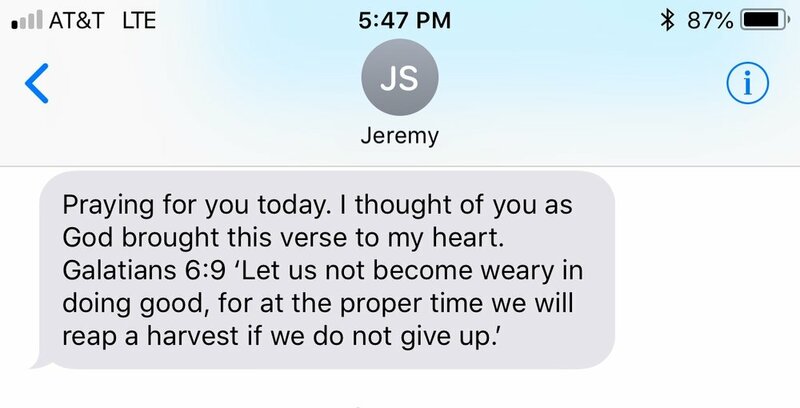 My proof is Jeremy’s message which serves as my reminder regarding which of my two internal boxers I always need to side with. ~ Peace and Merry Christmas.